Since the Picture has everything to do with my Culture (the foreign folk Lore), the lack of subtitles was not much of a curse although I missed the fun they would doubtless have brought with them. I must add, though, that the Charectors, Costume and Incidents mostly bear little resemblance to the original firangi tale anyway, not that it matters one whit. They occupy themselves fighting the treacherous King John and his “Shareef” of Nottingham, who is not in the least shareef. I particularly love King John’s clothing and accessories. I must confess here that I had trouble telling the difference between King John and the Sheriff—they looked exactly the same to me, with their pointy goatees, gaudy clothes and evil smirks. Maid Marian’s father added to the confusion, although I think he might have been a good guy (that’s just a guess though since I never got to see the end of the film). 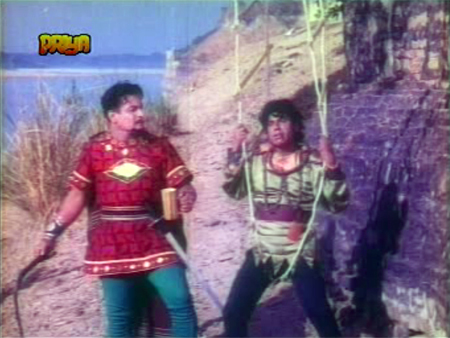 King John and the Sheriff are aided and abetted by my favorite B-movie villain Shyam Kumar as someone named Lord Jambal (I think) who cherishes an unrequited passion for Maid Marian. How I love his strutting and tendency to shout his lines towards a point just beyond the camera. The Sheriff’s platinum blonde daughter Shelly (Nilofar) cherishes her own passion for Lord Jambal although I think her father wants her to hook up with King John (who seems willing enough). Robin Hood meets jolly Friar Tuck first, and then Alan-a-Dale, a minstrel whose fiancee (Lino Jones) is kidnapped by an evil nobleman who murders her father and wants to marry her. I’ve seen Lino in a lot of B-movie adventures, mostly as a dancer. She is hilariously wooden, even when being “forcibly” dragged away by said nobleman. I am no actress myself, but I think even I could muster up the appearance of a struggle for a few minutes. Not our Lino, though, no. Her task is just to look pretty, and she does it well. 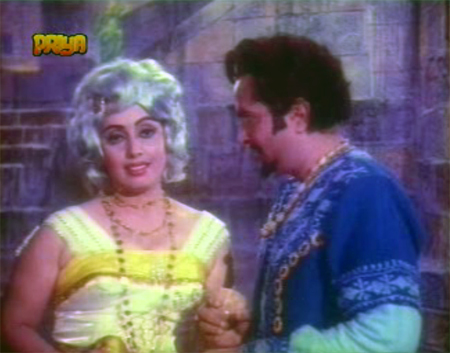 After she is rescued, Friar Tuck marries her to our minstrel Alan, and they get a fair share of the gorgeous music in this: a duet—“Pyar Ki Baat”—and a ballet-type dance for her. Okay I’m done with her now. Sorry. It’s just so thrilling to see one of my people in a lengthy role! I would like to know the name of the actor who plays Alan—he gets two songs of his own (“Sawar De Jo Pyar Se”—a happy and a sad version) and looks vaguely familiar. He is unfortunately captured towards the middle (or end, now) and half-heartedly whipped by the Sheriff, who keeps his beverage firmly in his grasp. Much of the “action” (and “acting”) in this is perfunctory, as if they were all hot and tired. Maybe they were! I laugh and laugh when Shelly attacks Robin Hood and he fends her off with one hand, looking at her as if she is a pesky mosquito. The women in this are variously attired in strapless evening gowns, flirty sixties shirtwaist dresses, spandex stirrup pants, and combinations thereof (plus some fashions which I can’t even begin to describe). There is a LOT of Spare Hair on these sets too. Although romance isn’t truly the point here, our hero and heroine get two songs, one Rafi solo which is lovely (“Maana Mere Haseen Sanam”) and a lively duet “Jawan Jawan Husn Ke”. 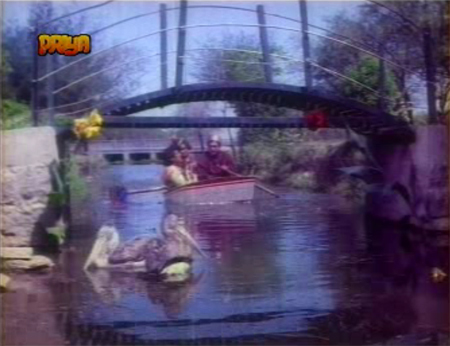 The sets vary from actual Mughal fort to precarious styrofoam English castle. 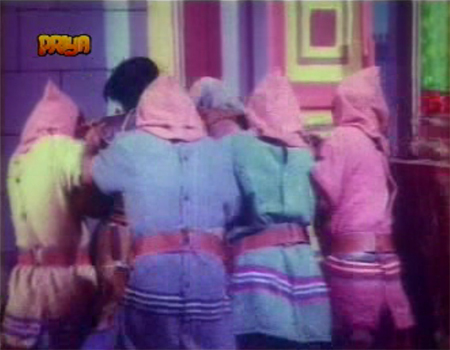 This is a film with a very very low budget, but with lots of love and attention lavished on it by people who did the best they could with what they had, even if that was mostly large paper flowers and pink hooded sweatshirts. So even with its problems, I am glad this movie made its way into my hands (especially for free). See it for the songs, especially, and for the crazy Goodness that is always inherent when Indian ingenuity meets the foreign folk Lore. Posted on December 29, 2009 at 12:00 pm in Hindi movies	| RSS feed You can skip to the end and leave a reply. OMG! Thank you for the best laugh out loud moment I’ve had in weeks!!! Oh, those dastardly dvd manufacturers indeed! I think I would have died! I did a lot of choking myself while watching it, especially at the abrupt finish. I seriously could NOT BELIEVE my eyes, and I don’t say that much any more. I believe the burning problem was a technological issue with burning the master vcd. Yes, should have been something they could do something about. Yes, mind-bogglingly idiotic excuse. Yes, incompetence has never been so glaring. But still. I think that’s what they meant. LOLz!!!! Memsaab, you should create a new tag for these films: “Burning Problem” movies!! She is! The very same!! I’ve seen her in about six or seven films now that I can remember. She’s just so random (although very pretty)! 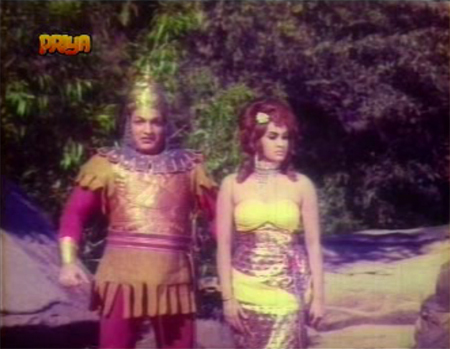 Why wasn’t I a tall, leggy blonde living in India in the 1960s?! WHY? context of “customer service” in public places. Oh it’s said respectfully here too but generally young women are called “miss” and “ma’am” is saved for the older types. I was only speaking in answer to his question about addressing older people in the US anyway. 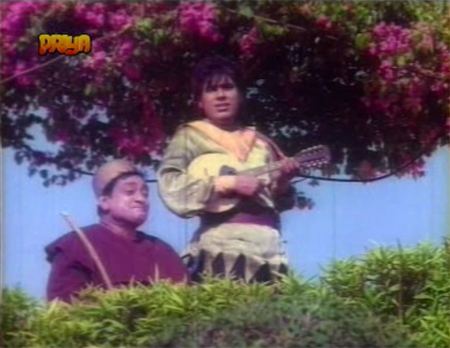 Ah, ‘Mana Mere Haseen Sanam…’! 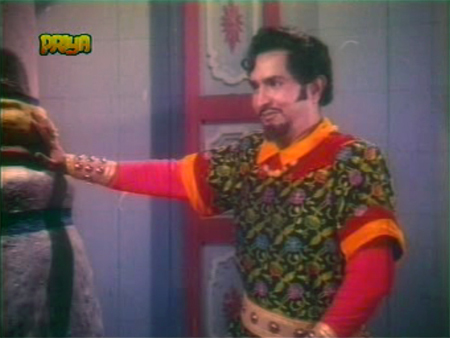 One of the greatest Rafi numbers, and sadly, like lots of others, wasted in a B-grade stinker like this. Well, I’ve seen much worse “A-grade” stinkers :D The music is really lovely in this, every song a gem. 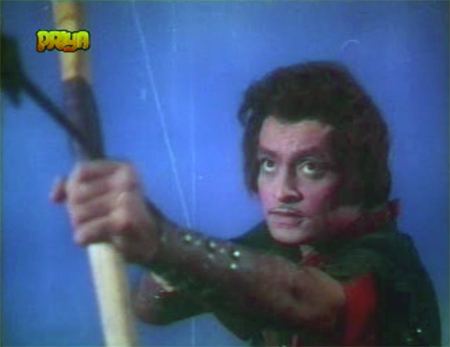 I don’t think I have ever seen a movie starring Prashant? 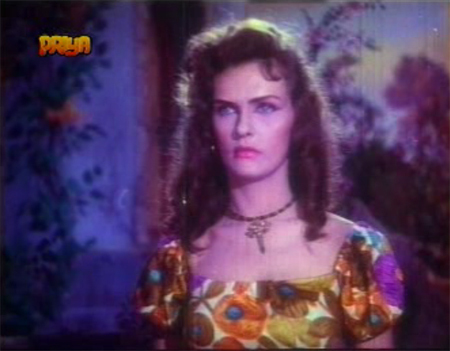 Oh, but I do love me some Parveen Choudhary (whose name seems to be spelled differently in every movie she appears in), and she looks too cute with that bouffant hair…and indeed that is Nilofar as Shelly. I would love to know whatever became of Nilofar and Parveen. 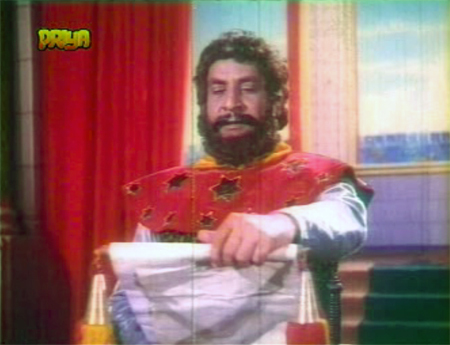 Pehaps they sit around drinking chai and reflecting on some of these ghastly, but o-so-fun movies that they made. What a find this movie is! Priya certainly isn’t known for their quality VCD product, but maybe another company will burn it onto DVD in it’s entirety. As far as I could tell, Prashant was kind of cute. And thank you for verifying Nilofar’s identity, although I was pretty sure about it :) Names are hard in Hindi cinema, so I generally go by the imdb name (which for PC is Praveen, although the Choudhary spelling is always confusing for me)…I wonder what became of them, too. Would love to know! And fingers crossed for a better version of this film. 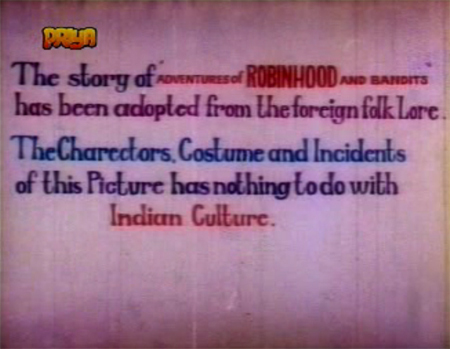 I think that first disclaimer (about costumes) applies to bollywood movies esp from the 2000s! Brilliant. Thank you for that review – I haven’t laughed so much in ages. But nobody (and no film) deserves that sudden “Burning problem” – do you think the burning problem was that they finally ran out of funds? 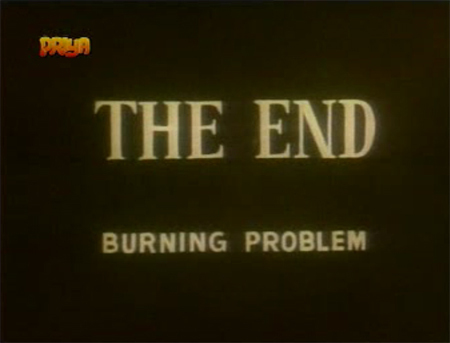 ‘The End Burning Problem’ sounds like a great tagline for Preparation H.
Oh my dear god, how did I not read this when you originally wrote it? That’s got to be the best disclaimer I’ve ever seen (and I’m desperately trying to figure out how to apply it to my own life). The whole thing is so…pastel! It’s like Robin Hood done by Wonka by way of the community theater “even we can’t use this stuff anymore” costume closet. memsaab, I clicked on this link only because I saw the comments had been updated! Oh my God! How could I have missed this! The review is hilarious, the film looks (unintentionally) hilarious, and the icing on the cake has to be the DVD maker – I had to sit down to absorb the shock of the movie ending where the plot (should have) began. Ha ha, I am glad to hear it Anu :D There is so much left to discover, too, that we should be able to keep your husband entertained for years to come—as well as our own selves, of course! At least you are warned about the Burning Problem. It was quite horrifying for me :) And thank YOU for your kind words, makes my day. -The End Burning Problem : Epic in itself. -Lino Jones : Pretty lady indeed. Now I am looking forward to get my hands on this movie… can’t wait to watch it. I don’t remember seeing Lino anywhere… I guess I have to be more attentive now. 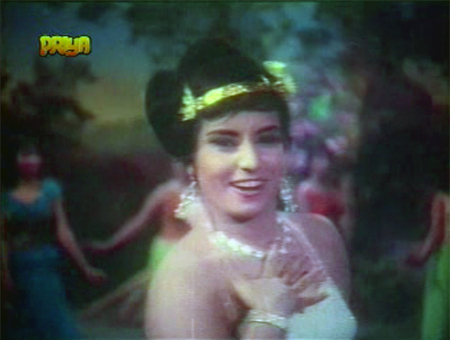 Have you watched Prashant’s other movie, Sehra(1963)?